Thursday, April 18, Business After Hours. 5-7 pm. Blue Heron Gallery, Elk Rapids. 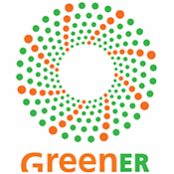 Saturday, April 20, Earth Day Coffee & Conversation w/GreenER. 9-10:30 am. HERTH. Saturday May 18, Super Recycling Day. 9 am - 3 pm. Bridge Street. Elk Rapids. Monday May 20, Village Council Green Elk Rapids night. 6:30 pm. HERTH. Elk Rapids. With Guest Speaker Joe Hemming, Simms Conservationist of the Year. Anglers of the Au Sable. Thursday July 25, Special Guest Speakers. 5:30-6:30 pm. HERTH. Elk Rapids. With Authors James & Deborah Fallows of "Our Towns: A 100,000 Mile Journey Into the Heart of America". Thursday August 1, Harbor Days Movie. 2-4 pm. HERTH. Elk Rapids. Happening: A Clean Energy Revolution. In this award winning documentary, presented by Green Elk Rapids, filmmaker James Redford embarks on a colorful personal journey into the dawn of the clean energy era as it creates jobs, turns profits, and makes communities stronger and healthier across the US. Unlikely entrepreneurs in communities from Georgetown, TX to Buffalo, NY reveal pioneering clean energy solutions while James' discovery of how clean energy works, and what it means at a personal level, becomes the audiences' discovery too. Reaching well beyond a great story of technology and innovation, "Happening" explores issues of human resilience, social justice, embracing the future, and finding hope for our survival. Thursday, July 12, 5:30 p.m.
Held at the Elk Rapids Marina Pavilion, Dan Egan presented on his book, The Death and Life of the Great Lakes. In his informational presentation, he spoke of his book and of the Great Lakes that surround Michigan. There were 200++ indivduals in attendance. Saturday May 26, 10:00 a.m. The GTRLC will collaborate with GreenER to offer a guided public hike at the spectacular 389-acre Maplehurst site, a former camp enjoyed by generations of families. GTRLC is actively fundraising to protect this site as a future public natural area for Milton Township. GTRLC currently owns the property on an interim basis with plans to transfer ownership to Milton Township and public access within the year. The property is not currently open to the public but will be open for this special occasion. 10:00 a.m., 12055 Warring Road, Elk Rapids. Monday May 21, 6:30 p.m.
​A special village council meeting at HERTH, 6:30 p.m., will focus on environmental programs and host Grand Traverse Regional Land Conservancy executive director Glen Chown. Chown will present highlights of the Conservancy’s 26-year history, featuring recent Antrim county efforts. Please note: Prior to the Water Ceremony, there will be a local water walk, assembling at 9:30am at the old Bathing Beach 8975 N. Lakeshore Drive, along the shoreline and into Veteran's Memorial Park. All are invited to participate in this walk. Friday May 11 at 6:30 p.m.
​ Saturday April 21, 9:30-11:00 a.m. HERTH, 401 River Street. Join the committee for coffee, tea, pastries, and stimulating discussion. Bring your own coffee mug/tea mug and save a Styrofoam cup. Start your Saturday in good company! Join the Green Elk Rapids committee for an informal discussion and Earth Day orientation on Saturday, April 21, 9:30-11:00 a.m. The group is celebrating its tenth year as a volunteer organization, and is asking for input on future programs. With a mission to raise awareness about environmental issues, they are inviting the community to share ideas and suggestions for future events. 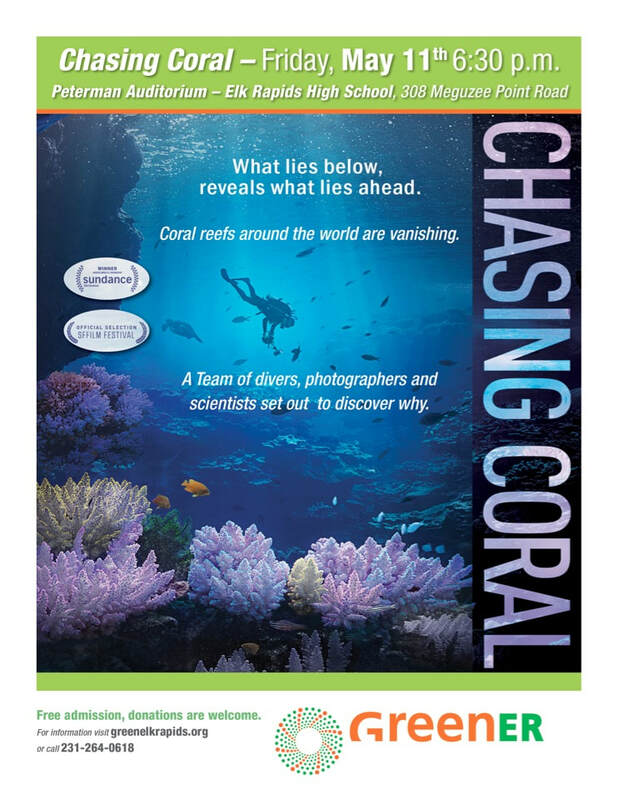 The agenda highlights international Earth Day’s 2018 theme, Ending Plastic Pollution. John Nelson, Bay Keeper Emeritus, will facilitate the discussion, and research intern Bonnie Hamilton will review the status of plastics in Lake Michigan. 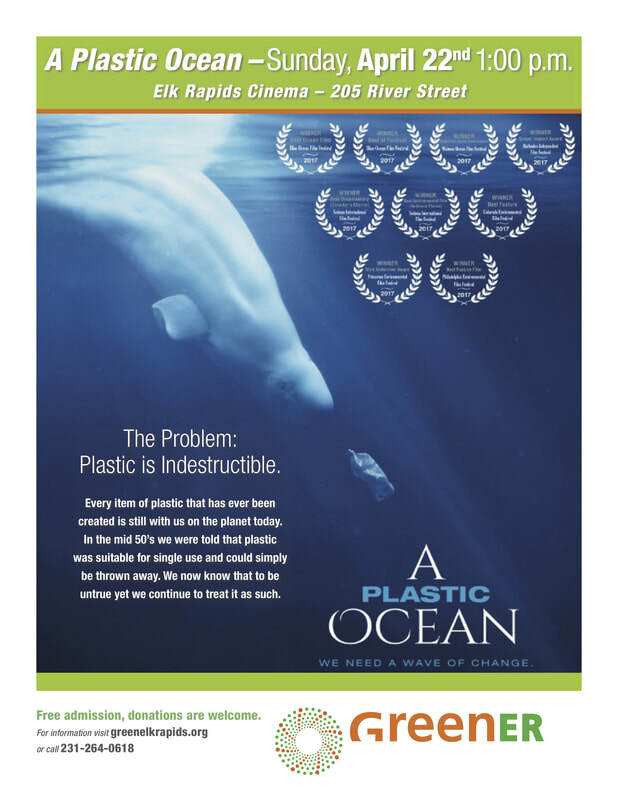 a preview of A Plastic Ocean, the award-winning documentary showing the next day, April 22, official Earth Day, at 1:00 p.m. at Elk Rapids Cinema. ​​The problem of plastic pollution is growing exponentially every year; we are producing more than 300 million tons of plastic, half of this is designed for single use, and each year around 8 million tons of it ends up in our oceans. We can solve this problem and we can do it by educating and engaging everyone in a conversation to rethink plastic. Plastic Oceans is working to change the way we deal with plastic waste by challenging society’s perception that this indestructible substance can be treated as ‘disposable’.